We are adding a new mobile Tea-House to our legendary fleet - the T-Crab! This newest bike version is being envisioned to better demonstrate environmental sustainability than our previous truck-based models. It will also allow us to use it more frequently and in a wider variety of contexts given its adaptability and smaller scale. 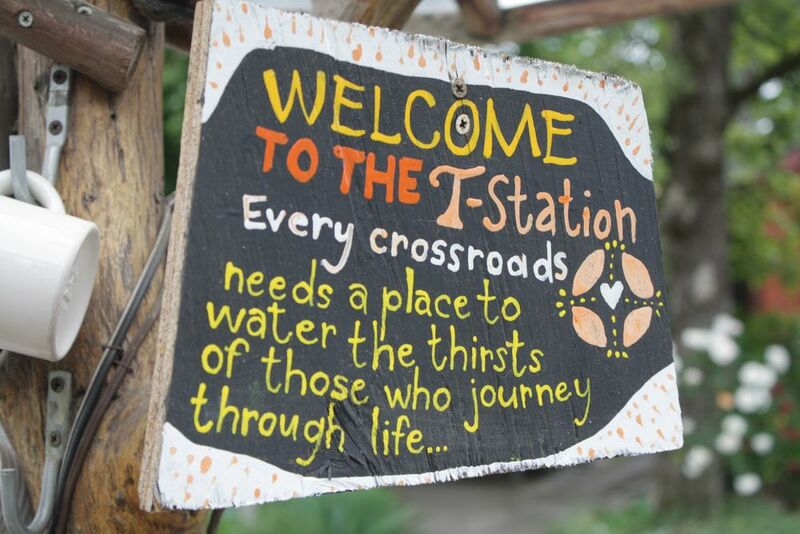 The T-Horse is a mobile Tea House, serving as a place to gather and build community. 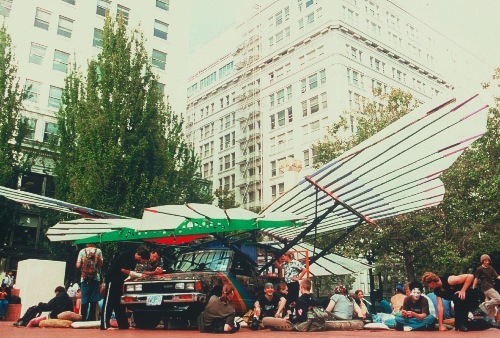 It is an ephemeral or temporary structure to support the placemaking movement, an approach to the planning, design and management of public spaces. Placemaking capitalizes on a local community's assets, inspiration, and potential, with the intention of creating public spaces that promote people's health, happiness, and well being. 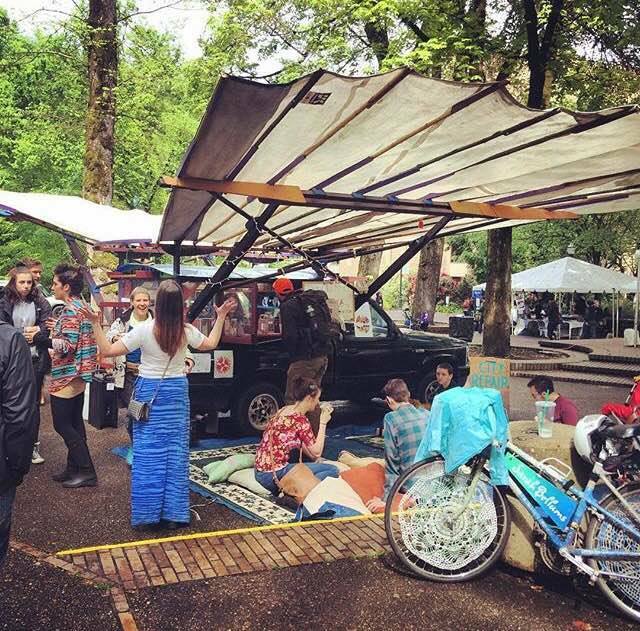 People have been gathering around tea for years and we wanted to make community plazas more accessible so City Repair created a mobile plaza in the form of a Tea House. For this mobile placemaking unit, the T-Horse, we use a vehicle that serves the tea from a structure in the back cab designed to be a small tea house, then create the space around the vehicle for people to gather on pillows and cushions under large magical wings. It is quite a sight to see! People get to participate in creating it, like a barn raising, by attaching the large wings on the side of the vehicle made from bamboo and sails that offer protection from the rain and sun. Under these wings we lay out carpets with soft pillows and cushions for people to sit and relax on. We offer a few different blends of homemade herbal tea to share as people congregate at this beautiful mobile tea house, as people have gathered around tea for centuries. The space offers hospitality and programming to support communities to grow, skills to build learning from each other and leaders in the community. The T-Horse has been used in partnerships with organizations like Outside In to create a safe place for at-risk youth to hang out and do art, learn from local leaders and develop new skills and friends. 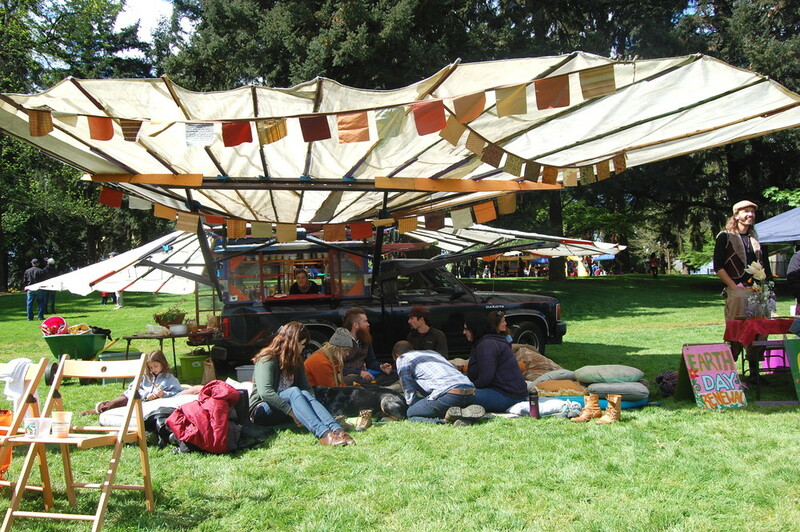 The T-Horse has also created a place for people to relax at events such as Oregon Country Fair, Pickathon, weddings, and more. It offers a warm, friendly and magical environment and has been known to bring neighbors together through block parties and potlucks in parks like Ladd’s Addition. This unit was creatively designed by City Repair. We host open discussions, interactive visioning games and participatory art. Through facilitated discussions, we will pose questions and elicit solutions that integrate triple bottom line approaches to a resilient future for all. Come join us!! Thank you to all those who participated and contributed in the T-Horse in the past. This magical mobile creates great memories. For Volunteers, what the Tea Service Looks like. The tea service entails serving tea to people as they come up to the T-Horse (you don't need to serve tea that entire time, we have a few people taking shifts). You will be in the back cab of the truck where we have built out a small tea serving area. The tea is concentrated so you will pour a small amount into a cup (1/3 cup) and fill the rest with hot water. The guests can choose to add cream or honey to their tea if they like. We will have shifts, that last an hour or two as well as loading, set-up and breakdown needs. It is a wonderful community building experience where the volunteers actually get to participate in building the T-Horse as we set-up the wings and create the space by laying out the rugs, pillows and cushions for people to gather on. If you want to get involved in this or future T-Horse events please contact us at, info@cityrepair.org.